EID’s argument also fails to consider local conditions. Almost all of the water used for fracing in the Eagle Ford and in the Permian Basin in West Texas is groundwater. Those groundwater resources are already being depleted much faster than they are being recharged, mostly from agricultural and municipal demand, but exacerbated by the current drought and the demands of the oil industry. Even though the burning of the oil and gas produced from those areas does produce new water molecules into the water cycle, that fact does not replenish the aquifers or increase the chances of rain in those arid parts of our state. 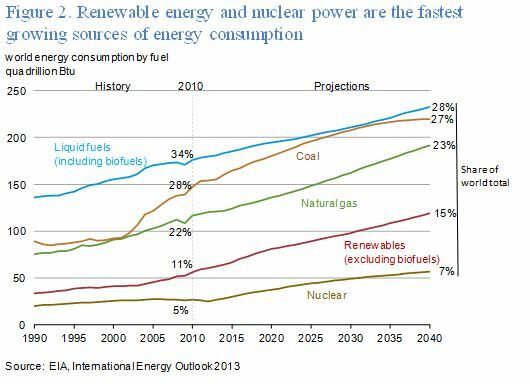 The US Energy Information Administration recently projected that world consumption of energy from all fuel sources would increase by 56% through 2040. Most of that increase will come from burning fossil fuels. Burning all of that fossil fuel will certainly create lots of “new” water. Is that a good thing for the environment? Energy generation uses huge quantities of water. Nuclear plants as well as electric generation using fossil fuels require water for coolant. While that water stays in the water cycle, it is nevertheless a demand that must be met, and in Texas that demand is increasing exponentially. Only wind and solar energy need no water to generate electricity, and – even though Texas is the US leader in wind energy — wind and solar are as yet a small part of electricity production. A recent article in the Christian Science Monitor calls for recyclying of frac water. Some companies are experimenting with use of brackish (salty) water aquifers. EID and its sponsoring companies would do well to increase industry’s efforts to reduce or eliminate use of underground water in hydraulic fracturing.